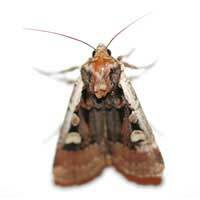 Moths and gnats are two of the most common, persistent and annoying of pests. Although neither of them represent much of a health risk, the irritation factor of both – for entirely different reasons – makes them rank high amongst the list of least welcome visitors to our homes and gardens. Fortunately, there are ways to reduce the problems they cause – and as with most kinds of pests, knowing a bit about them can often be a big help. There are around 160,000 species of moths in the world, of which some 2,500 have been recorded in the UK, but only three tend to make serious nuisances of themselves – the clothes moth, the brown house moth and the white-shouldered house moth. Between them, they represent an all too common threat to our carpets, clothes and soft furnishing, particularly when they are present in large numbers. While the adults themselves only live for a few weeks, their voracious caterpillars – which do the damage – live for up to six months. Good housekeeping is one of the most effective control strategies and regular vacuuming can be all you need to protect your carpets from the ravages of these hungry insect larvae – although for particularly valuable items, you might want to think about moth-proofing treatments. For clothes and other fabrics, regular washing or dry-cleaning can be a very useful weapon in the fight against moths, since stained or soiled materials are particularly attractive sites for the egg-laying adults. When prevention isn’t enough, fortunately there are a number of pesticides that can help. Residual insecticides offer good protection and there are many different kinds on sale, including DIY fumigation products, cypermethrin-based preparations and a variety of organic treatments, so whatever your personal principles, there is sure to be something to help. As a general preventative measure, you might also like to consider aromatic red cedar wood – a wonderful smelling natural alternative to old-fashioned moth-balls. At the other end of the scale, the most high-tech approach involves a special trap which attracts male moths – luring them onto a sticky pad with the irresistible smell of breeding females. Gnats – or midges – are small and persistent biting insects, rather like miniature mosquitoes, which tend to travel in swarms, adding considerably to their nuisance value. Typically flying late in the afternoon and into the early evening, they can turn alfresco summer dining into a misery although there are some steps you can take which can be effective in reducing both their numbers and their impact on your life. Repellents are available – to be applied either to yourself, or in and around your garden – which claim to offer varying levels of protection for periods of up to a fortnight. Unfortunately, however, if they are present in large numbers, it may be necessary to resort to more heavy-weight solutions. While the old-timers in the days of the British Empire used to rely on gin to make their blood unpalatable to these little biting blighters, today a variety of devices are available which should put these pests off the scent – in some cases, quite literally. Some give off a particular aroma which confuses the insect’s sense of smell, while other types use high frequency ultra-sounds to disorientate the gnat and stop it finding its prey – namely you! Some people have found that simple forms of natural pest control – especially growing Pyrethrum and using citronella candles – can prove particularly effective. There are also more traditional aerosol sprays and pesticide powders available from a variety of DIY stores, garden centres and other outlets which can give long-lasting protection for infested areas. Alternatively, if gnats are making life difficult indoors, well-fitting window and door screens may offer you the best chance of peaceful nights! Of all the beetles, bugs and flies which bother us, gnats and moths rank high in the irritation stakes, and although they don’t threaten our physical well-being, the nuisance they pose can be considerable. However, with a little understanding of their life and biology – and a knowledge of the measures available to deal with them – we don’t have to let them make our lives a misery.